Looking at the photos of this bright and spacious kitchen, it is hard to believe this was once a small and boxed space. Animal lovers Shelly and Chris had two ideas in mind when they decided to remodel their 90sqft kitchen from the 1930s: to create a large open floor plan kitchen with plenty of storage, and to have a pet-friendly for their 5 cats and 2 dogs. Envisioned by our designer Ido, the new kitchen was completely transformed to offer a roomy, functional and beautiful space with our client's and pet's needs in mind. From creating a new floor plan combining the kitchen, dining room and living room to replacing the roof, repiping and rewiring to installing new tiles and cabinets, the project took 3 months to be completed. The first step for the remodel was to create different floor plan options to reconfigure the kitchen. On the left, floor plan of kitchen before remodel. 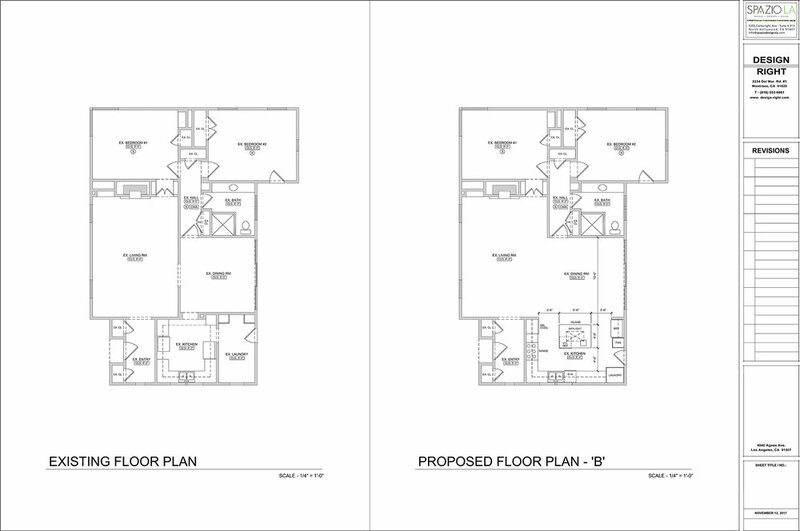 On the right, new floor plan chosen by client incorporating the kitchen, laundry room, dining room and living room. After getting the approval for the floor plan, an architectural and engineering plan was created and permits were pulled in order to start the actual remodel. Because this was an old house, we started with changing the roof, repiping and rewiring the entire house and installing new windows, doors and skylights. 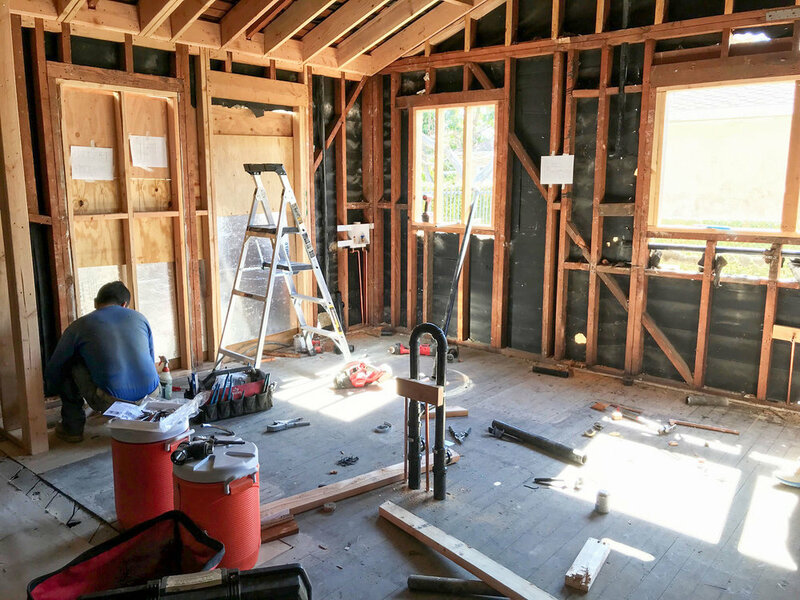 Demolition, framing and rough plumbing and wiring of the house. Once plumbing, wiring, roofs and new walls and windows were ready, we started the installation of custom built cabinets and kitchen island. New custom built cabinets during installation. One of our client's cats enjoying the new kitchen island during installation. The final steps of the remodel included the installation of tiles, appliances, and fixtures to achieve a transitional, airy and fun look. This eco and pet-friendly space features all-white custom shaker cabinets, brushed nickel Bosch appliances, white Caesarstone quartz countertops, a laundry closet and a dedicated area for the pets. Custom shaker cabinets, white Caesarstone quartz countertops, Bosch appliances and farmhouse style Blanco sink. 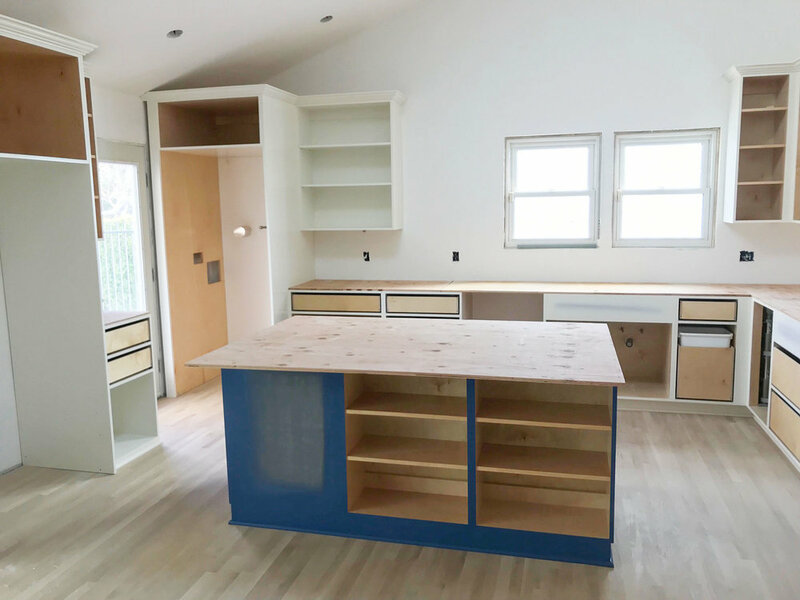 To give the kitchen a focal point and a pop of color, a custom blue kitchen island was added with an extra sink, a wine cooler, and even more storage space. Kitchen island with extra storage space, sink and wine cooler. A pot filler was added above the Bosch cooktop to make cooking easier. 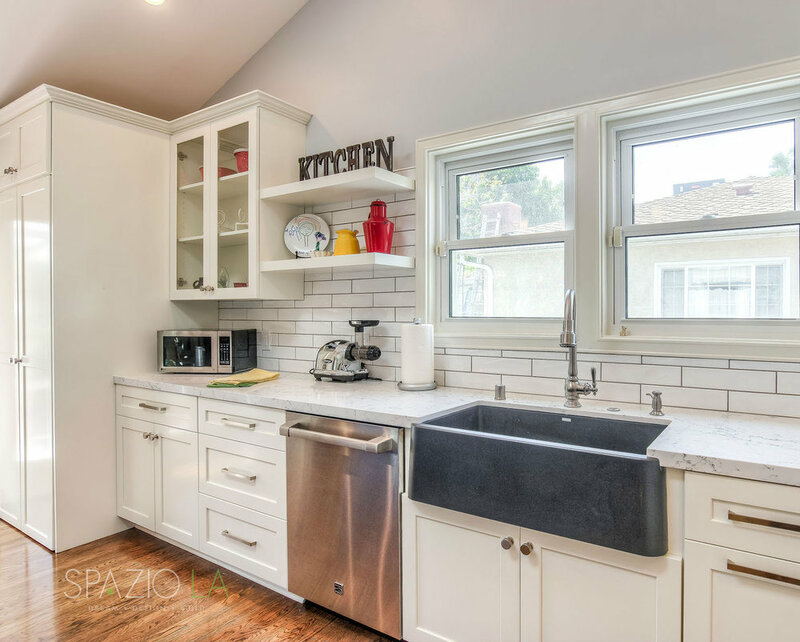 The white shaker cabinets and brushed nickel appliances were paired with a white subway tile backsplash and accent grey arabesque tiles for a touch of color. Cooking area with Bosch cooktop and separate ovens, pot filler, white subway tiles for backsplash and grey accent arabesque tiles. The client's pets received their own dedicated space and cabinets for their food and water and extra storage space for their toys, food and treats. Pet's cabinets and dedicated food and water space. Designer Ido, Shelly and her grandbaby enjoy the newly remodeled kitchen.